In 1948 seven men of Okinawan ancestry from Hawaii sailed to the U.S. mainland on their first leg of an incredible journey. They were headed to an Oregon hog farm to purchase 550-head to help in a Hawaii-based relief effort for war-torn Okinawa. The tiny island of Okinawa was devastated by the Battle of Okinawa, where more bombs were dropped and more naval guns fired than any operation in the Pacific during World War II. The Okinawan community in Hawaii joined by other ethnic groups raised nearly $50,000 to restock Okinawan hog farms. Needless to say that was quite a remarkable feat back in those days and during those challenging economic times. Those seven men cared for the animals in makeshift crates aboard a military transport ship on that 28-day voyage from the U.S. to Okinawa. They encountered storms, seasickness and floating mines but they accomplished their mission. The last surviving member of those seven men, Mr. Yasuo Uezu recently passed away in July 2011. The Chinese dating back to the 14th century influenced the Okinawans’ love for pork. Okinawa is just 400 miles from China and they established an economic and cultural relationship that thrived to the 16th century. When Okinawans started migrating to Hawaii to work on the sugar plantations in 1899 they brought their food traditions with them. Practically every family raised pigs for special occasions and when the plantation contracts ended, some of those families raised pigs as major source of income. Today, a few of those Okinawan family farms are trying to keep the culture and tradition alive. The irony given this historical backdrop is that Hawaii hog farms have been in steady decline for decades. According to the Statistics of Hawaii Agriculture reports, there were 650 hog operations in 1978 statewide as compared to 230 in 2008. Hawaii lost 430 farms or over 65% of its hog operations in this 30-year period. (These statistics include operations with one hog on up so the actual number of commercial operations will be significantly less). Competition with imported pork and the rising cost of feed coupled with residential encroachment and societal pressure will continue to challenge our local farms. According to the USDA, Americans consumed roughly 50 lbs. of pork per capita in 2008 and for Hawaii the vast majority was imported. Hawaii’s food security or insecurity is a hot button issue as well it should be. The UH College of Tropical Agriculture and Human Resources estimates that 85% of fruits and vegetables we consume can be grown locally by 2020. Our greatest challenge will be protein security and keeping our livestock industries viable. The Hawaii cattle industry is dependant on an infrastructure that has atrophied and with limited processing capacity. We are down to two commercial dairies on the Big Island and 4 commercial egg farms on O’ahu. We have no commercial poultry farms supplying locally raised chickens and our aquaculture industry has its own share of challenges. Hawaii’s people mobilized and responded to the crisis in Okinawa after WWII, and most recently to the earthquake and tsunami victims in Japan. People were in dire need of aid and Hawaii’s people didn’t hesitate and gave generously. Can we afford a crisis before we act on our own behalf? Can we, as people of Hawaii today demonstrate our support and aloha for our own farming community? Only demand for Hawaii grown products will encourage investment in expanding local food production. 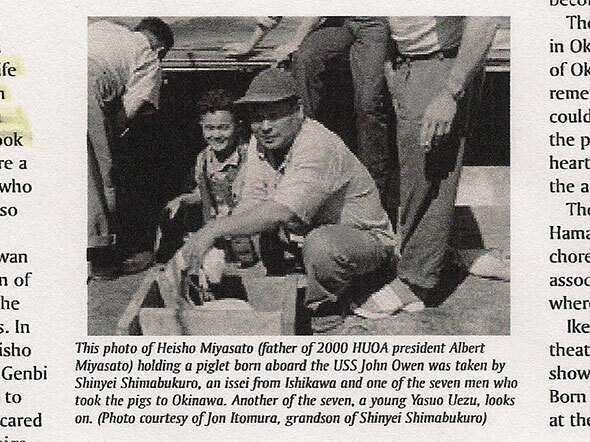 We were compelled to write this commentary after interviewing two Okinawan hog farmers. Their family farms date back to the early twenties and forties with multi-generations involved with their operations. Okinawans in Hawaii have a strong sense of pride for their heritage and culture, as do people of all cultures in Hawaii. If we can collectively summon our local pride in support of our own, we will position our communities to be more resilient and food secure as we move forward. which i buy always although it is much more expensive. let us know who is raising, growing local.